On the Oregon Coast between Florence and Yachats, several dirt roads head west into the mountains from US101. A ride over Fairview Mountain Road sounded like it would be the best bet for a great ocean view. From West. The profile starts at about sealevel where US101 crosses Big Creek. The route follows US101 up to the top of the next hill and then takes the dirt road at the crest up into the forest. The best moment of this ride came, where the road climbed out of the cool coastal layer of haze, and sunlight refracted through the trees in a fairytale like spectacle. A good workout leads to the top of the ridge. The closest thing to an ocean view, can be had through the trees with a telephoto lens a long ways below the summit. From South. The road switches over to the north side of the ridge for a short time and then climbs two more summit points. Apparently the last one is the real top. The route becomes paved at the jct with FR58. There are many ways back down from here. The shortest would be Deep Creek Road. 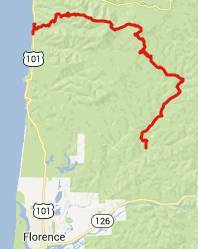 But the profile chooses the only completely paved route, staying on FR58 and then descending towards Florence on the Upper North Fork Siuslaw River Road. This is another great isolated forest road with nonexistent traffic and many old moss covered trees to watch out for. Notes: The nicest scenery along this loop was admittedly not going over this summit, but along US101 on a very scenic part of the Oregon coast. However, the traffic there in August is horrible, while I saw no cars at all during the climb and the descent of this summit.